To be a women’s 100m finalist, you needed to run faster than 12 seconds in order to make the at-large qualifying cut. Harvard’s freshmen of Gabrielle Thomas and Ngozi Musa won their respective heats in 11.66 and 11.81. Thomas’ time is tied for the first fastest in meet history. Cornell’s Adrian Jones also broke into the meet top-10 – her 11.73 ties her for the eighth fastest in meet history. Other qualifiers in clude Penn’s Taylor McCorkle (11.82), Yale’s Sydney Cureton (11.86), Dartmouth’s Kaitlin Whitehorn (12.01) as the auto-qualifiers, and Brown’s Audrea Holt (11.94) and Columbia’s Ashley Cunningham (11.94) as the at-large qualifiers. Meanwhile, running sub-2:10 does NOT guarantee you a spot in the 800m finals. Penn’s Ella Wurth missed the cut with her 2:09.94. Who made the cut? Two-time Indoor Heps 1000m champ Sarah Hardie of Columbia has the fastest qualifier in 2:07.43 and will be joined by her teammate Brittney Wade (2:08.70). Princeton also has two qualifiers – Ashley Forte (2:08.41) and Zoe Sims (2:09.64). The remaining finalists include the Indoor Heps 800m champ Shannon McDonnell of Yale (2:08.95), Brown’s Taylor Worthy (2:09.18), Dartmouth’s Bridget O’Neill (2:09.36), and Cornell’s Shannon Hugard (2:09.65). Penn’s Sam Mattis makes it four in a row – both in terms of Outdoor Heps championships and resetting the championship meet record. He won with a new meet best of 204-11, besting his mark from last year by 2 feet and 4 inches. Penn finished with 18 points as Noah Kennedy-White finished as the runner-up in 184-04. Cornell’s rookie Kevin Benson improved his discus personal best by almost 27 feet to finish in third place with 183-02. 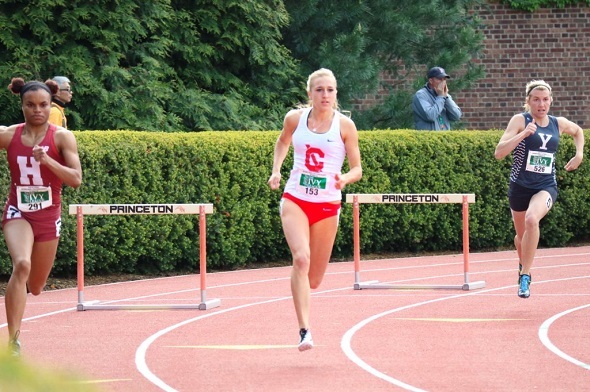 Cornell sophomore Taysia Radoslav is hoping to break Harvard’s Jade Miller’s winning streak at Outdoor Heps. Radoslav ran the fastest prelim time of 57.66 – a new personal best, 5th fastest in conference history, and 2nd fastest in meet history. Miller had the third fastest time of the day – 58.87 – as she finished behind teammate Autumne Franklin (58.40). Franklin’s time is 5th fastest in meet history. These three women were the only sub-60 times of the prelims. Other finalists include Dartmouth’s Marissa Evans (61.78) and Kathleen Sprout (63.08), Princeton’s Meghan McMullin (61.84) and Carly Bonnet (62.07), and Cornell’s Ellery Bianco (62.04). Brown’s O’sha Williams won her first Outdoor Heps title, and she needed a new personal best to do so. She held off Harvard’s duo of Allison Morrison and Gabrielle Thomas to claim the long jump title. Williams won with a distance of 18-11, while Morrison finished in second place (18-10) and Thomas was third (18-07 3/4). Princeton’s Allison Harris earned her first outdoor pole vaulting title on home soil. She was the only athlete to clear 13 feet in the competition. In fact, Harris did not enter the competition until all of the other athletes finished at 12-01 1/2. Second through fifth place all cleared 12-01 1/2, but Harvard’s Lexie Schachne was awarded second place due to misses. This entry was posted on Saturday, May 7th, 2016 at 3:43 pm. It is filed under Heps Champs, Spotlight. You can follow any responses to this entry through the RSS 2.0 feed.